This is a reprint of a 2007 article © Peter Bowden. Permission to copy granted with attribution. In September of 2007 my wife Amy and I offered a sermon for Association Sunday that offers a new way to interpret what the name Unitarian Universalism means. We suggest that how people explain our name is a huge stumbling block for our movement’s growth. We preached from an outline so there is no full text. The following shares our ideas and how we arrived at them. Please feel free to share comments. 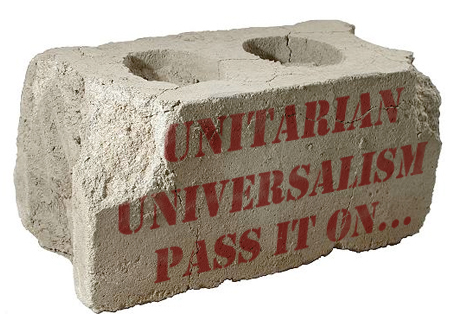 I’d like to offer you a new way to share Unitarian Universalism with the world. It is a positive affirmation of what we are today. It has been crafted to not only be easy for YOU to remember and share, but easy for the people you share it with to remember as well. I’ll share it with you and then explain how Amy and I got to this. If you need to explain this to someone don’t go to a rehearsed elevator speech, history book, wikipedia or even a UU Principles card. Simple go to the name. If we look at our the root words in our name we find UNITE and UNIVERSAL. What do these mean in terms of our congregations today? Unitarian has the root “unite” meaning to bring together. What kind of people do our congregations bring together? We bring people of diverse beliefs together. Can you remember that? If you explained it to someone else, could they? If so, this is huge. Why? Because our movements ability to grow and spread is crippled by the challenge most of our members and friends have sharing our faith. In September my wife, the Rev. Amy Freedman, and I preached on growing our faith. This was part of the 2007 Association Sunday, a special Sunday raising funds for the Unitartian Universalist Association’s growth efforts. Together we explored why Unitarian Universalism isn’t growing and offered our solution – making our faith easy to explain. In his book The Tipping Point, author Malcolm Gladwell suggests three things that need to be present in order for something to reach a point where it “tips” and spreads though a population. The context or circumstances need to be right, there must be a passionate core group advocating for the idea or product, and lastly, whatever it is must be what Gladwell calls “sticky”. Look at the world today. In my opinion, the context for sharing Unitarian Universalism couldn’t get any better. The world is ready for our our message. Criteria number one, the context? Check! Next is a passionate group of supporters. Gladwell calls this the Law of the Few. Tipping doesn’t require millions of people. A small number will do just fine. We have thousands and thousands of people ready, willing and trying to share our faith. Criteria number two? Check! Two down. The world is ready. We have passionate people trying to share our faith. Why on Earth are we so slow to grow? What’s missing? This is where the third criteria comes in. As it is presently explained, Unitarian is not sticky at all. What does stickiness mean? Simple. For an idea to spread you have to be able remember it long enough to accurately share it with someone else. Sticky ideas are easy to remember and share person after person after person. According to Gladwell if you can’t remember what someone tells you you will never change your behavior or buy their product or go to see the movie they recommeded. Criteria number three? Yikes! Big problem. You see the problem. Explaining our faith is often like a brutal version of the game telephone. You know the game. You put a bunch of people in a circle and whisper something in the ear of the first person. They whisper it – as best they can remember – to the next. And on and on it goes. If there is any complexity to the phrase or story shared, by the time it goes through the chain of people something very different comes out the other end. How many people with no knowledge of our faith could your explanation survive before degrading? I’ll let you be the judge. But imagine… Imagine what would happen if we could overcome this lack of stickiness! Think what would happen in we suddenly met all three of Gladwell’s criteria for a movement that could spread with ease? 3) A faith that is easy to explain and share – ?????? This Summer Amy and I spent three days at our annual General Assembly conference interviewing people about Unitarian Universalism for a video. You can find it online by Googling “You’re a Uni-What?” Again and again people thanked us for working on this video and affirmed that it is hard to explain. Given this, for Association Sunday Amy and I decided to focus on what would need to happen in order for our faith to spread. We had read The Tipping Point. I had read other books on the subject such as Seth Godin’s Unleashing the Idea Virus and Purple Cow. Instead of just pushing people to craft their own elevator speeches and support the UUA’s growth efforts, we wanted to offer use the Association Sunday to overcome the stickiness issue. Amy and I talked about the average NON-STICK explanation of Unitarian Universalism. We came to the conclusion that it isn’t that Unitarian Universalism is hard to explain, but that the way people explain it is flawed. When discussing our faith with newcomers people often try to explain far too much up front, that or they don’t explain anything. People have told me that they actively avoid discussing our faith because they know they aren’t up to the task. Those who do try might explain the Christian origins of the names Unitarian and Universalism, follow up with a disclaimer that we’re not really very Christian, at least many of us, and then explain what our congregations are like now. Friends, this is not a good way to tell someone about us. If your congregation is like ours, a Christian message is not at the center of what you are about. If this is true, we shouldn’t lead with historical explanations of our name. Instead we suggest offering a modern interpretation of the name “Unitarian Universalism” that is both accurate and relevant for our world today. Sitting in a café discussing the UU-NON-STICK problem issue with Amy, I suggested that we need to re-brand Unitarian Universalism. We agreed. It is time for us to share with the world, not our history, not a disclaimer that we’re not this or that, but hope. And this hope is no longer about the unity of God or the nature of salvation. Today our message, the Unitarian Universalist message, is about diverse people with diverse beliefs coming together and living lives based on the values that we share. The UUA’s most recent capital campaign has the slogan, “Now is the Time.” We think now IS the time for our faith. But all the marketing campaigns in the world won’t help us grow if the we can’t get our name, our message and idea of Unitarian Universalism to stick. Fortunately we don’t need a lot of money to change how we talk, just intention. Together Amy and I offer you our new and improved explanation of Unitarian Universalism. So far people love it and have found relevant, personally appealing – they can identify with it — and much much easier to remember. All you need to do is remember the name of our faith. The rest is in there. By infusing our name Unitarian Universalism with new meaning, we can make it easier for our members, friends, and their friends to tell others about our faith. Amy and I think that this explanation is sticky and through it we can meet Malcolm Gladwell’s stickiness criteria. 3) A faith that is easy to explain and share – check! If you agree, we invite you to teach people this new way to talk about our faith. We can tell people what Unitarian Universalism means today. After they understand this we can follow up with our shared Principles and Purposes and all the UU history they want. Is it helpful in starting meaningful questions?